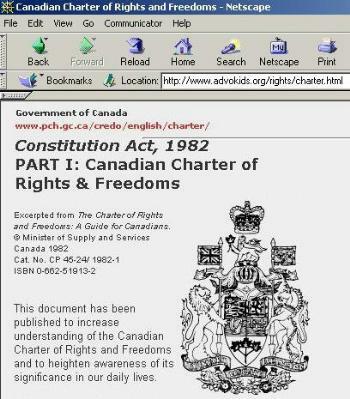 Laws for the Peace, Order, and Good Government of Canada,..."
You are required to look at this document so that you will understand its main points for BUS 203, and, your life as a Canadian citizen.
. The textbook discusses mainly the legal / regulatory environment - however there are also other environments effecting organizational behaviour and HRM. We will show a video produced by the "Employment Equity Commission" of the Ontario government. 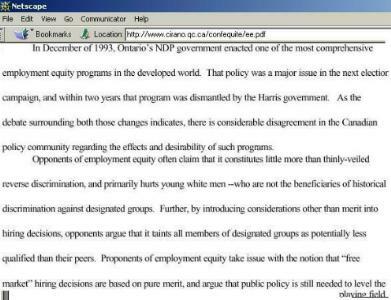 You should understand that while this video is useful in discussing employment equity issues, the legislation enacted to enforce compliance - no longer exists. 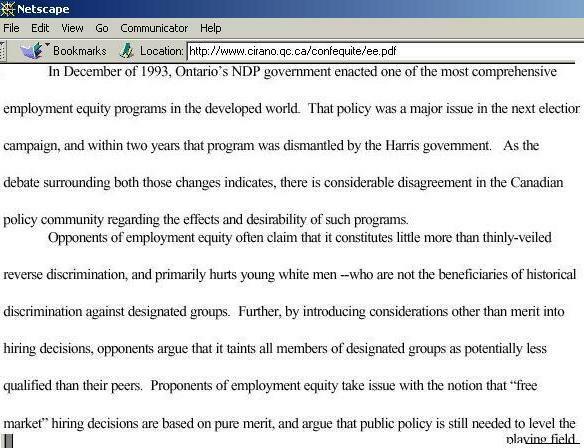 Employment Equity Legislation was brought in by the NDP government in Ontario in the early 1990's. When the Conservative government came to power, they eliminated the Employment Equity Commission. Some medium and large sized companies and institutions, however, continue to strive for employment equity principles because they have reasoned it would be a good thing to do based on the evolving cultural and demographic changes to the consumer market in Ontario. 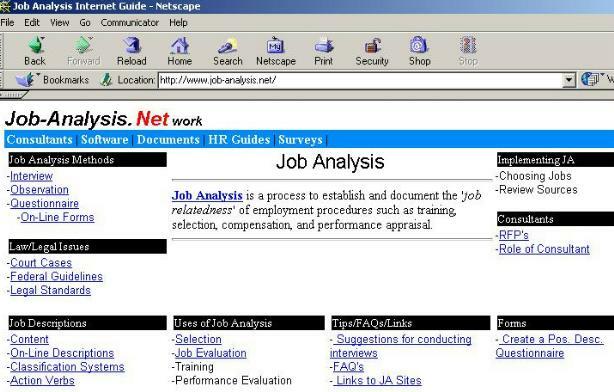 Text - "Job Analysis - a systemized procedure for collecting and recording information about jobs"
Job Analysis is a process to establish and document the 'job relatedness' of employment procedures such as training, selection, compensation, and performance appraisal.
. Why we learn about Recruiting. Three main methods of obtaining work exist. Networking: networking fills more jobs than any other method. Unfortunately many people cannot do the "networking thing" and must depend upon other methods to obtain a job. 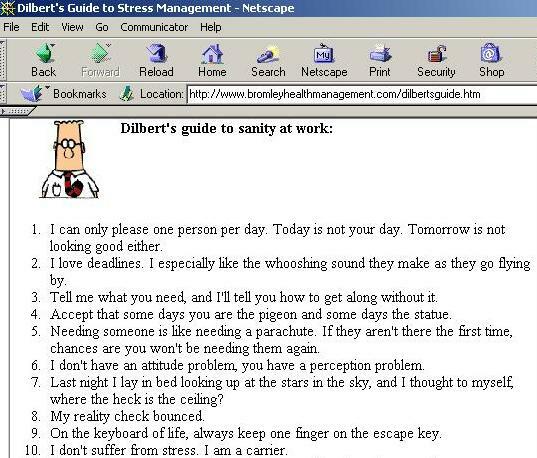 Advertised jobs: Most people use this method. However only about 15-20% of new, available jobs are advertised in the paper. Only a small % of Canadian jobs are posted on the net - and they're almost always hard-to-fill Information Technology jobs. Recruiters: Recruiters normally fill between 20 to 40% of most types of positions. At the highest level (CEO, President, VP and director level) the percentage is usually higher than 40%. At the lowest level of unskilled jobs recruiters normally fill a smaller percentage than 20%.
. Normally, when people think of recruiting, it has a military connotation - but the term is now widely used in business to describe not just hiring, but the actions a company takes to get the best people when hiring. In the new millenium, recruiting is considered one of the key functions of a company, like production and selling - the reason is based on the understanding that "recruiting" the best people, gives a company a competitive advantage - just like having a good design, or a low price. 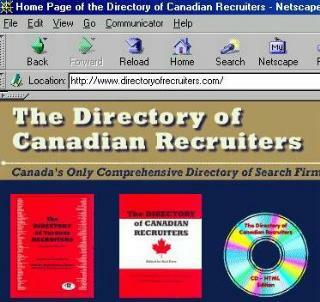 More than 3000 recruiting companies operate in Canada. Recruiters have a variety of names including headhunters, management consultants, executive search firms, placement companies, office support agencies, employment agencies and industrial help companies.
. Getting the right people to work for your company can give you a competitive advantage. For medium and large sized companies - in many situations, the people they want to hire, are already working for other companies; so, they hire recruiting firms who find these people, then talk to them, and convince then. One way to get a job in middle management (after you have gained some experience and have a decent resume) is to make sure you are listed with the leading Executive Search firms. 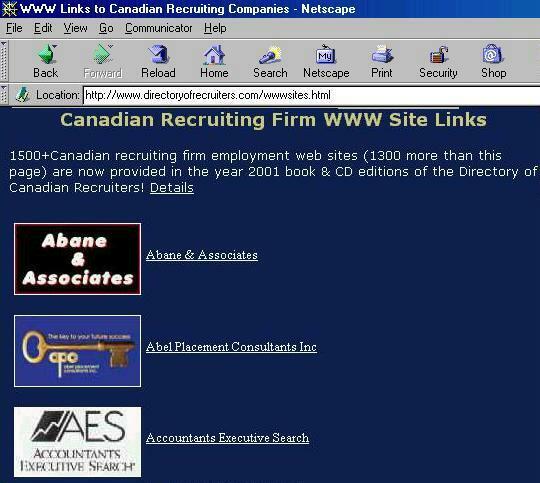 Now, there are web sites and directories listing these firms - as noted below. Never ask "If there are any jobs available". 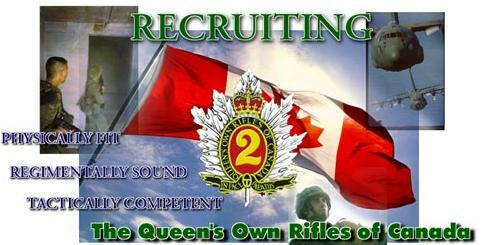 Never ask the recruiter if he/she "can get you a job." Never tell the recruiter "I'm looking for work." Never tell the recruiter "I'm unemployed." Avoid pressuring the recruiter to consider you for a specific advertised or web-posted position. It's better to be considered for all the positions they're filling. Your objective is to spark their interest and talk with them - not to get the answer "no."
. Training and Development is also important in the millenium since it allows companies to keep good employees, and also make sure the employees can do the most advanced tasks, which keeps the company competitive.
. For those people that don't know, Major Marcel was the American Air Force Intelligence Officer who was first on the scene at Mac Brazel's ranch in Roswell, in 1947, when there was allegations that a UFO crashed. Marcel was later coerced into saying it was a weather ballon, and that he made a mistake - however his Postwar Service Evaluations were always cited as examples of a man that was reliable and not likely to make a mistake. "As it turns out, once Marcel's service record began making the rounds in 1996 and 1997, it became clear that Marcel was generally very well thought of by his superior officers both before and after the Roswell events, including those directly involved in Roswell, such as Col. Blanchard and Gen. Ramey. There are no clear references to the Roswell events in his post-Roswell evaluations, which are overwhelmingly laudatory." Compensation "Show me the money"
In the textbook, there is reference made to Husky Injection. 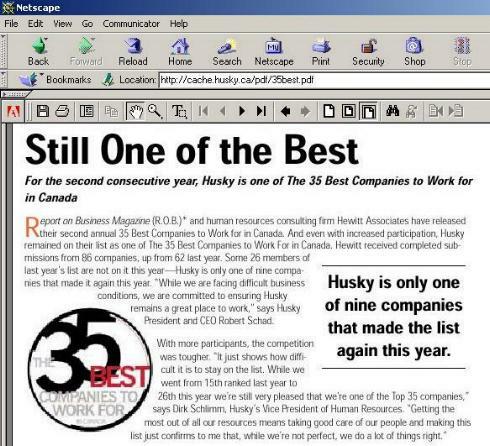 You are encouraged to go to Husky's web site and read the article about them being ranked as one of the "best companies to work for"
. In the beginning of Chapter 15 it discusses CAMI Automotive. You should review this page (413) and be prepared to discuss the difference between the North American and Japanese approach to labour - management relations.
. 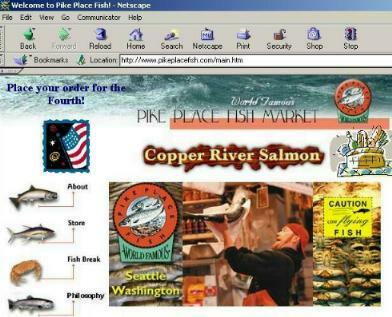 In the class held July 4th/July 5th we looked at a video about a fish market in Seattle. The purpose of the video was to develop an understanding of how positive attitudes in the workplace environment can bring benefits to the people that work there + benefits to the customers - who will then want to buy more product - which sustains the business. The fish place in the video is in truth quite famous and there are several web sites which talk about it and the dynamic of the work environment there. Not surprisingly, the people that work at the fish market have become aware of their popularity and now offer courses and seminars, in fact, they deliver a two-day seminar in Seattle called "Inside-Out: Essential Principles for Creating a Vital Workplace"
. Part of the reason why we selected this video for BUS 203 is that the course is essentially about dealing effectively with HR situations in a world that is increasingly stressful and competitive - as a result, it is more and more difficult to "Smile while you work"; - that is to say have fun at what you do. If you do have fun at what you do, you never work a day in your life - says an old Irish expression; at the same time, if you are having fun at work, and this is shared by the customers, then it is also beneficial to the organization as a whole. Key elements are flexibility and dealing with stress in a way that won't weaken you. 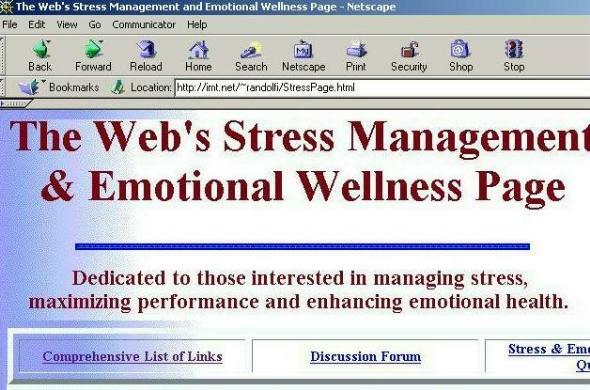 A somewhat humorous approach to "stress management"